Streaming is the digital zeitgeist, that much is clear. How it will shape the future of the music business, from artists through to labels is less clear and things are not helped by an increasingly confusing and diverse set of data, each suggesting a slightly different outlook. 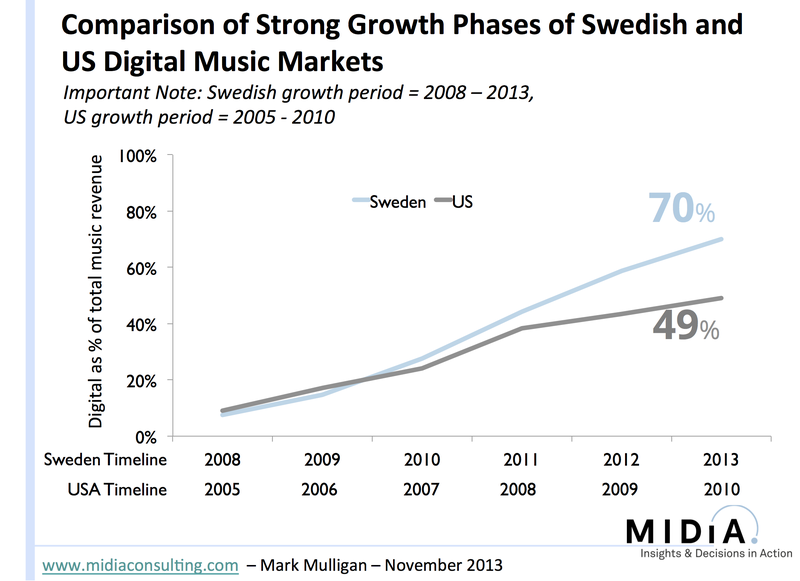 A look at two very different digital music markets – Sweden and the US – gives some sense of what the next couple of years should hold. Notes: for sake of readability the term ‘streaming’ is used to refer to subscriptions and ad supported streaming combined. Also all current year figures are 2013, extrapolating half year figures to create full year estimates. Sweden is streaming’s heartland, home of Spotify and the stand out good news story for music subscriptions. Streaming now represents a whopping 95% of digital revenue in Sweden and 67% of all recorded music revenue while downloads make up a paltry 4%. 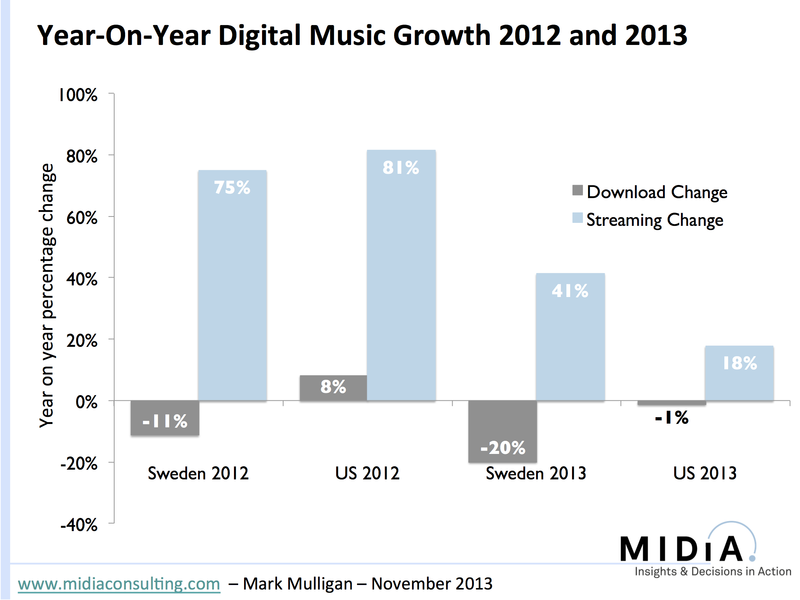 Streaming growth has been equally impressive (see figure one) and has propelled the total Swedish music market into growth for two successive years. That growth came at the direct expense of downloads (which declined by 15%) and it accompanied a dramatic 51% collapse in CD sales. But 2013 revenues look set to come in at just a little below 2003 levels, no mean feat. Although we need to bear in mind that a surge in growth can easily reverse (as the experience of South Korea shows us) it is clear that streaming has been a strong positive force on total Swedish music revenues. The picture is very different in the US however, where streaming has grown less dynamically and only represents 23% of digital and 14% of overall spending. As I previously noted, the strength of Apple and the download sector have acted as a pronounced brake on streaming growth in the US. Neither, however are invincible, and some of Spotify’s 2013 growth has come at the direct expense of download spending which looks set to decline by a percentage point in 2013 (see figure two). Little wonder Apple has launched iTunes Radio, though ironically the app may well spur a resurgence in download sales. So in the US streaming is becoming an increasingly important part of the market but shows no sign of suddenly acquiring Sweden-like ubiquity. 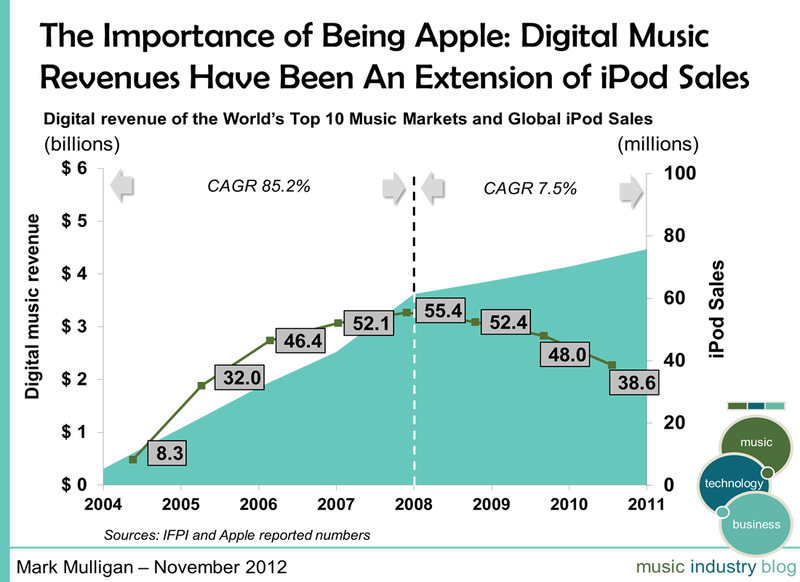 Which in part explains a 5% decline in total music revenues between 2010 and 2013. CONCLUSION: streaming can quickly drive strong growth in markets where downloads never got a foothold but takes more time to impact strong download markets. 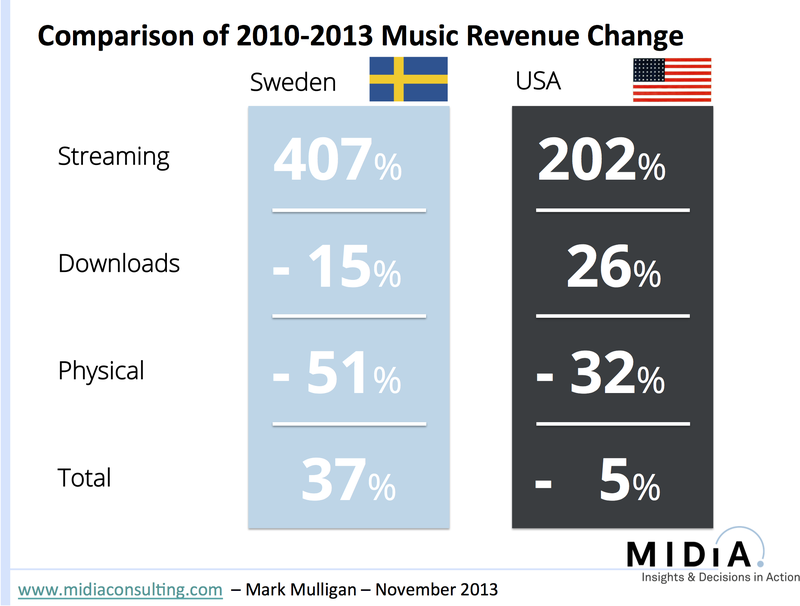 Streaming’s impact on the total digital market and indeed on total music sales is of course what counts most, and it is here we see a really interesting divergence between Sweden and the US. Over the last 6 years streaming drove a comparable rate of overall digital growth in Sweden that downloads powered in the US in the mid 2000’s. But when we plot the growth of digital as a percentage of total music sales in the US between 2005 and 2010 against the same data for Sweden between 2008 and 2013 a stark contrast is immediately apparent (see figure three). Whereas digital share growth remained strong throughout the 6 years in Sweden it slowed markedly in the US. Though growth returned later it didn’t ever replicate those pre-2008 levels. The number one slowdown factor was the end of iPod sales growth (see this figure to see just how strong the effect was). 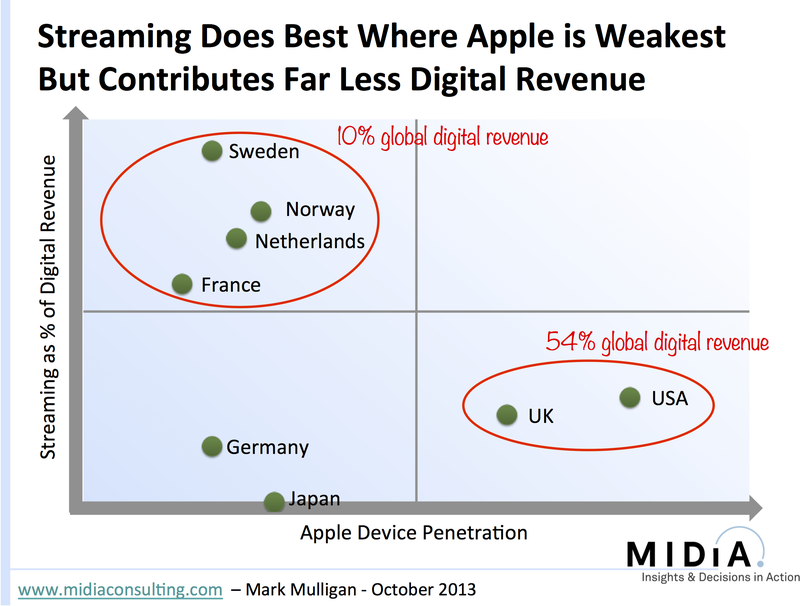 Interestingly digital share growth looks likely to slow moderately for both Sweden and the US in 2013. In Sweden some level of slowdown is to be expected (there isn’t much physical market left to transition!) but there is still a lot of CD ground to be made up in the US. 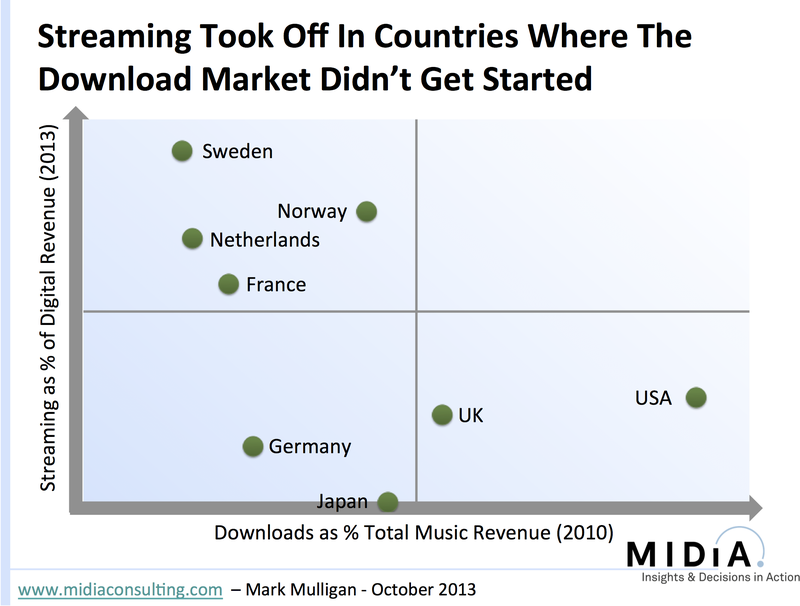 CONCLUSION: streaming has driven market growth in Sweden and accelerated transition away from the CD and the download. While in the US the CD and the download both still hold much greater sway, culminating in something of a worst of both worlds, with streaming apparently eating into downloads but not having enough headway to transform the market. But what does all this mean for artists? It often feels that something doesn’t quite seem to add up when artist income is brought into the equation. For all the growth in streaming income, a vocal minority of artists and songwriters feel that streaming is damaging, destroying even, their ability to earn a living from music sales. As I have argued before, a rounded understanding of streaming income for artists must both put streaming in a revenue continuum (i.e. compare it to radio not just downloads) and consider the life time value of a song (i.e. think of the income it will generate over a period of years instead of the revenue full stop a download represents). In this context streaming is still worth less than a download, but nearer to 5.5 times less valuable rather than 280 times (see my Consumption Analysis piece for more on this). 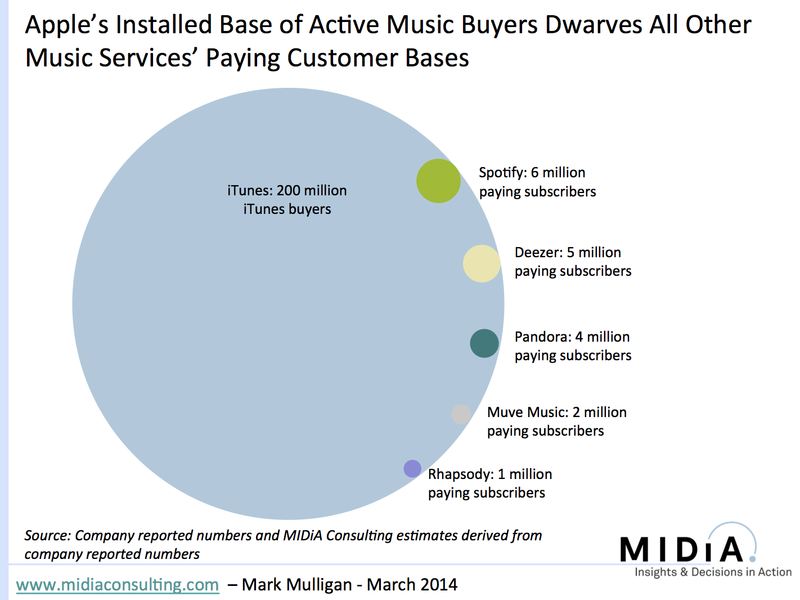 There is however an added complexity, namely the amount of artists that get revenue from streaming versus downloads and streaming (see figure four). If we take Spotify’s reported US metrics from 2012 as a benchmark and assume that the average subscriber listens to a modest 5 different artists a month then this is equal to 60 different artists per year per subscriber. Working with an average total royalty pay out of $0.01 per stream this translates into an average royalty per artist per subscriber of $0.72 in the US. When applied to the 3 million reported US Spotify subscribers this would equal an average annual royalty of $2.17 per artist. (Though it is crucial to note that this refers to the total royalty payment made to rights holders and not to whatever share is eventually shared with the creators themselves). Also, there is of course no such thing as an average artist, and in practice a comparatively small number of artists would earn much more than that and most much less (there are after all 27 million tracks’ worth of artists so the tail is super long). 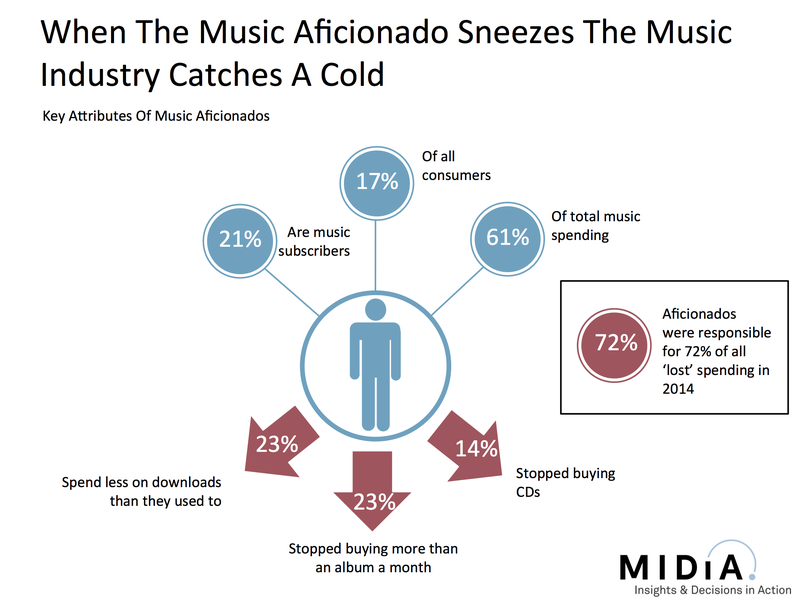 For downloads, extrapolating from Nielsen mid year numbers, the average downloader buys 2 albums and 27 single tracks. If we assume each of these is for a different artist then we end up with 26 artists per downloader and an average royalty of $1.22 per artist per downloader (using a 70% royalty assumption). This isn’t actually that much higher than streaming, but things change when it is applied to the total number of download buyers (which at 63 million far outstrips paying subscribers) and results in an average royalty per artist of $76.34 (again total royalty before distribution to creators). In Sweden though, where there are more subscribers than downloaders the picture is very different. Applying the same Spotify metrics to an assumed subscriber base of 2 million in Sweden (which feels about right based on survey data and IFPI numbers) we see an average royalty per artist of $1.44 compared to $1.22 for downloads. 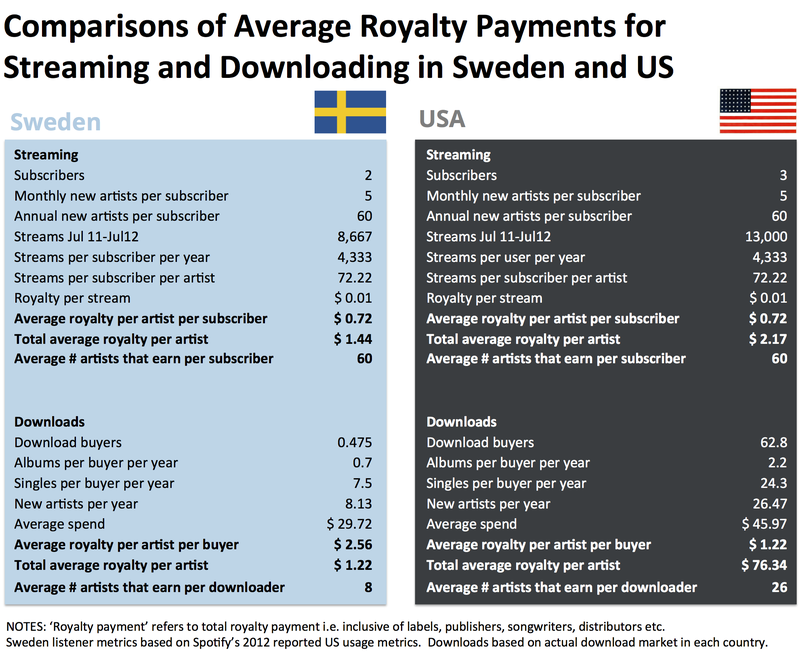 (The average royalty per buyer is higher in Sweden because a smaller number of people are buying a smaller number of downloads resulting in the revenue being split fewer ways). CONCLUSION: streaming can generate meaningful revenue at scale but will still be lower than downloads because of the above mentioned life time value factor and because revenue is split more ways across a wider selection of artists. Thus artists are effectively paying the price for the democratization of music: more artists are getting listened to more regularly and as a consequence the pie gets cut into smaller slices. Which raises the interesting dilemma of whether artists speaking out against streaming are also indirectly speaking out against a more equitable distribution of income among artists?! The core question though is whether the pie can get large enough for those slices to represent anything more than an apetizer for the average professional artist. All of this extra data may appear to add as much fuddle as it does clarity to the debate, but it is crucial that debate is based upon reasoned understanding of the most complete grounding of data available. The next couple of years will see streaming go from strength to strength but its impact on global music revenue will be less dramatic than it has been in Sweden, if perhaps more vibrant than it has in the US.